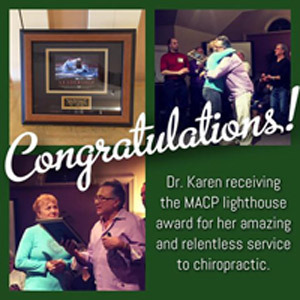 Congratulations to our Dr. Karen on receiving the MACP Lighthouse Award, for her amazing and relentless service to chiropractic! Dr. Karen received the award on Saturday, at the Massachusetts Alliance for Chiropractic Philosophy during their Night of Chiropractic Philosophical Discussion. Congrats Dr. Karen! So very well deserved!